At the tip of Milton Point in Rye, New York sits the fourth oldest yacht club in the country. The American Yacht Club was built in 1883, and remains a classic setting for weddings, especially summer celebrations. An American Yacht Club Wedding is characterized by its on-the-water location and the calming beauty of the boats floating nearby. It is the quintessential “All-American” wedding venue. 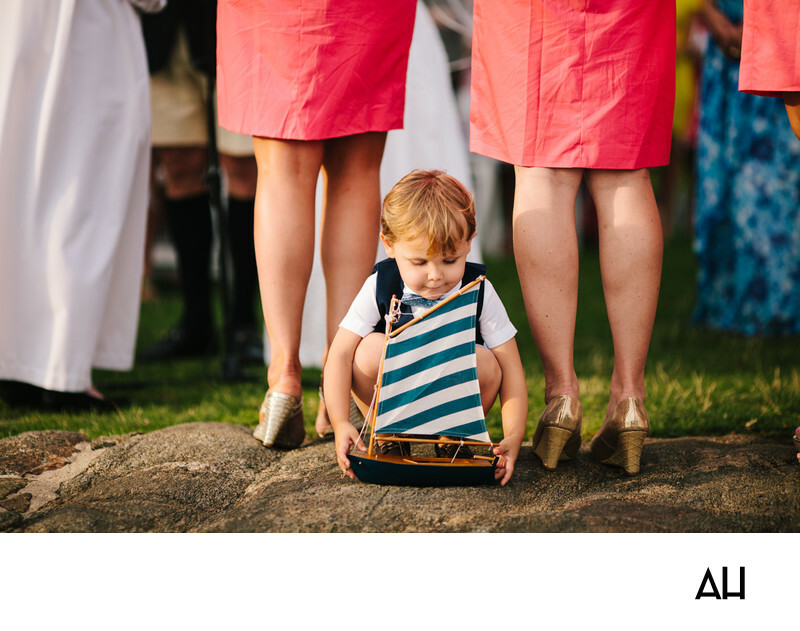 At an American Yacht Club Wedding, I have the opportunity to photograph fantastic views along the water, but this little boy caught my attention at the wedding pictured above. The bridesmaids stand in a line in their matching watermelon pink dresses, balancing unevenly on a rocky surface in their wedge shoes. Behind them, a small boy plays with a model yacht, seemingly unaware of the wedding festivities around him. It is an innocent image of a child playing in the midst of a busy, however beautiful, day. It is a tiny reminder for us all to take the time to breathe and enjoy the moment we are in, so that later we can enjoy the memories of the day as well as the pictures that hold them.